Bedding/litter that is dust free and non scented. Cardboard, hemp, megazorb or dust extracted kiln dried wood shavings are all fine for most hamsters in most cases. 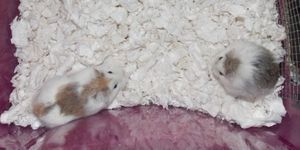 Any hamster can develop an allergy to any bedding so watch for signs of intolerance and change the bedding if needed. Fluffy or cotton wool type nesting material can become impacted in pouches, in the gut or get wrapped around feet and tails. You can use kitchen roll for nesting instead of fancier, more expensive products. Soft meadow hay can be well received by dwarfs and hamsters do eat this. It's not essential though if you have strong hayfever. A muesli mix and any added extras. Start with a bag of Harry Hamster and you can just add a little wild bird seed and a few dried mealworms or crickets. Treats. Avoid those packaged sugary (honey is still sugar) treats and buy a bag of dog biscuits. You can feed them many kinds of fruits and vegetables except citrus fruits and onions. You can also feed millet sprays, wheat ears and nuts in shells but feed all treats in moderation as it's most important that they eat their normal food. Toys. You will need a house, something to climb on, perhaps a shelf, tubes and maybe a sand bath at the very least. They'll need things to chew too. A sputnik, some wooden ladders, cardboard tubes and an upturned shallow bowl with childrens playsand in will do. Add cardboard boxes, egg boxes and extra loo roll tubes but make sure to cut these down one side if you have Syrians so they don't get stuck. You make your own from lollipop sticks and papier mache if you want. Some hamsters enjoy hammocks, others just chew them so see what your hamster prefers. Make sure to trim any trailing cotton off these. Water bottle. Buy one to use and one spare, just in case you need it. First Aid Kit. It's handy to have some trimmex for nails, plastic syringes, vet bed, an under tank heater or snugglesafe. Trimmex is very useful for nails if you catch one and it bleeds but you can use plain flour too. A plastic tank, the syringes, vet bed and heat source are all useful for a poorly hamster that is recovering. You should use these on the advice of a qualified vet that has seen your animal first. Carrier. You should bring a plastic carrier to pick your pet up in but it is good to put some thought into this. You'll need it throughout their life for any vet trips, or travelling when it's safer to do this in the carrier rather than a cage. You can go for something like an Aladino, or a plastic tank like a Ferplast Geo, Hagen or Rosewood. The tanks are more secure for long journeys but most pets will be fine in an Aladino style. Please do not buy they very tiny carriers that some pet shops sell. Have a look at websites like Amazon, Zooplus, Cages World and also some reptile sites sell plastic tanks too. It's important to remember that this is only temporary caging for a sick or recovering animal. Register at a vet. Before your pet gets ill, have a think about where to register your new pup. Take it along for a health check and see what you think of your vet. This gives you time to find another one before you have an emergency on your hands. Your vet should be keen to see your pet and unafraid to handle it. You do not need an exotic specialist, any normal vet with an interest in small animals should be fine.